Over 80 per cent of Canadians feel that buying a home is a good or very good investment. Only one-quarter of Canadians plan to purchase a home this year (down from 29 per cent in 2016); and highest among millennials (aged 18 - 34 years). 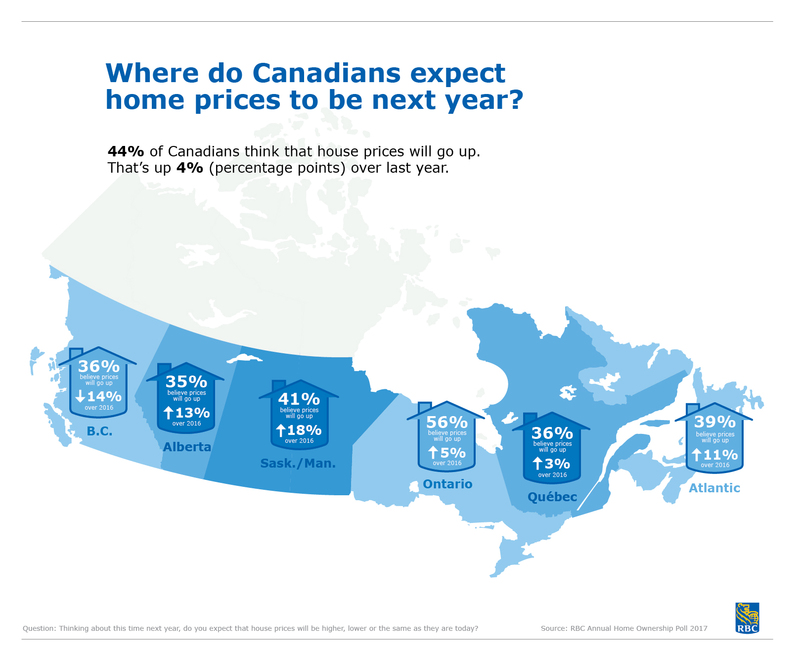 2017 RBC Home Ownership Poll: Where do Canadians expect home prices to be next year? TORONTO, April 10, 2017 - The idea of a white picket fence may be antiquated, but the dream of home ownership is alive and well in Canada. But with the average Canadian home price topping out at over $500,000 (Canadian Real Estate Association) many Canadians are finding home ownership to be out of reach. The idea of a white picket fence may be antiquated, but the dream of home ownership is alive and well in Canada. But with the average Canadian home price topping out at over $500,000 (Canadian Real Estate Association) many Canadians are finding home ownership to be out of reach. Despite this, according to the 2017 RBC Home Ownership Poll the majority of Canadians (82 per cent) believe that home ownership is a good investment…just not right now. The number of Canadians intending to buy a home within the next two years has decreased to 25 per cent, from 29 per cent in 2016. Millennials (aged 18 to 34), however appear to be feeling more optimistic than other age groups with two in five (39 per cent) saying they intend to buy a home in the next two years. Why are Canadians delaying home buying? Among Canadians who are delaying purchasing a home, the top three reasons cited include: belief that house prices may come down (58 per cent), uncertainty about the economy (51 per cent) and concerns about affordability (38 per cent). As home prices and carrying costs continue to climb, Canadians admit they are feeling the pressure. Fewer Canadians believe they are well positioned to weather a downturn in the market (65 per cent versus 73 per cent in 2016) or a potential increase in interest rates (57 per cent versus 63 per cent in 2016). Another one-third of Canadians (36 per cent) would be concerned if their mortgage payment went up by 10 per cent or more. “The homeowner journey starts long before you get the keys, and continues well beyond the first mortgage payment. Create a budget by knowing what you can comfortably afford throughout the home ownership journey. From there, arm yourself with expert advice, the right tools and resources to stay informed today, tomorrow and well into the journey,” adds Wells. In the information age, consumers are not starved for resources – they are starved for time. Understanding what tools are available and using them can help get the home buying research started how they want, when they want. With tools available to help with everything from assessing affordability, to interest rate changes, determining the best type of mortgage for your situation and even finding the neighbourhood that matches your lifestyle, research and information are critical to good decision making when buying a home. When it comes to housing prices, expectations vary greatly from region to region. Residents in British Columbia and Ontario feel strongly that they are living in a sellers’ market where demand is exceeding the number of homes available. But that is where the comparisons stop. For the first time in three years, fewer residents of B.C. believe prices will go up by this time next year, showing a change in perception that may impact the trend of the market. Meanwhile, all other provinces show an increase in the number of people who feel that prices will go up. Be patient: It is easy to get worked up and emotional during the home buying process. Staying focused and patient can help ease the stress that comes with this financial investment and can stop you from making a rushed decision on a home. Be informed: From budget constraints, to neighbourhood desires, know what you want and what you are willing to compromise. Try RBC’s True House Affordability tool to get pre-qualified in 60 seconds, and understand how much home you can afford. Be flexible: Stay open-minded to different locations that match your preferences and budget. Try RBC’s Neighbourhood Finder and learn what neighbourhood may be right for you, what amenities are nearby and the cost of homes. Although you might have your heart set on a specific neighbourhood, a nearby borough or even a similar pocket elsewhere might fit into your price range and still offer the lifestyle and amenities you want. Go local: The RBC poll shows that the home buying journey varies for Canadians based on where they live. Seek advice from market experts who know your city and neighbourhood as they will be able to offer the best advice for your situation. If you are considering your next home, try RBC’s Home Value Estimator and find out what your current home is worth today versus when you first bought it. Consider the costs: Saving for a home is no easy feat and it starts well before you begin your house hunt. Start by having a savings plan in place and aim to put down more than the minimum required down payment. Run scenarios to see how much you can afford over time as your monthly income fluctuates. This includes factoring in future events like having children. These are some of the findings of the annual RBC Home Ownership Poll conducted by Ipsos from January 13 to January 25, 2017 on behalf of RBC, through a national survey of 2,073 Canadians ages 18+ who completed their surveys online. Quota sampling and weighting are employed to balance demographics to ensure that the sample's composition reflects that of the adult population according to Census data and to provide results intended to approximate the sample universe. The precision of Ipsos online polls is measured using a credibility interval. In this case, the poll is accurate to within ±2.5 percentage points, 19 times out of 20, had all Canadian adults been polled. The credibility interval will be wider among subsets of the population. All sample surveys and polls may be subject to other sources of error, including, but not limited to coverage error, and measurement error.